27.December.2007 » Quiet Christmas here in Radland .. with the Bug gone for the holidays. I miss the little guy. Come to think of it, I've never yet seen him on Christmas. There's something I can look forward to. Maybe next year. Spent my Christmas learning about new technology » TTS, or Text-to-Speech. Specifically » TextAloud, a program which touts itself as the World's Most Popular Text to Speech Tool (not to be confused with Speech Recognition software, a completely different animal). I learned that sound-fonts are the things that really make a TTS program sing. The best sound-fonts are reportedly made by AT&T, called AT&T Natural Voices, altho many others compete in this emerging market. Unfortunately the demo version of TextAloud does not come with any premium sound fonts. And the sound-fonts cost more than the program. The AT&T Natural Voices sound-fonts weigh in at ~600 MB each .. whereas the TextAloud program is barely 3 MB. Premium sound-fonts use 16-kHz frequency. (By comparison, CD audio is 44-kHz.) Older sound-fonts use 8-kHz (low-quality). With a TTS program, you can record an entire eBook (or *any* text, for that matter) to output an MP3 file (one of TextAloud's supported file formats) and listen to it (on your favorite MP3 player) during your commute. In fact, I noticed a copy of the LAME MP3 codec sitting in the \TextAloud program folder, so you know they're using the best available. You can open any PDF file in TextAloud, and let it read to you. I do this when my eyes start to get tired. I outputted 3 (MP3) files for you to compare, by copy-n-pasting text from the site's splash page into the program's text window. The first uses the default cheapo sound-font, which comes standard with the TextAloud demo. This voice goes by the name of Sam. The last two use the highly-touted AT&T Natural Voices, which are supposed to be "the best". These files are posted here (Crystal) & here (Mike). Each file is ~20 KB (very small). You can test your own demos here, with more voices. I especially like the British voices (Audrey & Charles). They sound more elegant than US voices. By the way, your standard Adobe Acrobat PDF reader (I use v8.0, the freebie) can read text to you, by selecting Read Out Loud from the View menu. Not as good tho, as importing the PDF into TextAloud and using the AT&T premium sound-fonts .. but not bad, especially if your eyes start getting sore from reading too much Rad material (a bad case of Rad-eye). 23.December.2007 » Winter solstice yesterday. Shortest day of the year (for those of us living in the northern hemisphere). The word solstice comes from a latin term » solstitium, meaning sun stoppage. Extra cool with a full moon tonight. The exact time (when the sun reached its southern-most point and began heading back north was 1:08AM EST, which means winter actually began Friday night (10:08 PM) for those of us here on the Left coast. To celebrate the event I rode my bike around the Back Bay, with Tom, his wife & daughter. My first bike-ride since getting thrown off & landing on my cranium. Nice day. Lots of sunshine. No mountains, tho. I rode mostly with Tom's (7-yr-old) daughter, who's pace I found comfortable. Good news » the library (Newport Beach) is gonna buy the books I recommended (both of them) » Bulletproof Web Design (2nd ed. 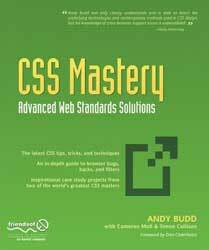 ), as recommended by Nate here » Best Book for Learning Cascading Style Sheets » CSS Mastery by Andy Budd, .. Finished another chapter in CSS Mastery today. Hadn't really noticed before the word Mastery in the title, at least not consciously. I merely knew it was supposed to be a good book on CSS. But it's becoming clear the term mastery includes notions of advanced & sophisticated (concepts which this book on CSS is presenting). I mean, advanced selectors are discussed in the very first chapter, along with other sophisticated concepts. Regarding the topic of style, I've been playing with a (cool) program called Color Schemer Studio. Design skills have never been my strength, so I like that the site contains (literally) thousands of pre-configured color schemes, contributed by users and subsequently rated (by the community). Each color scheme can be downloaded (*.cs file) and loaded into the program (to learn the hex value of each color). But this is not really necessary .. if you have a program like Color Cop (freebie). So I've been perusing hundreds of different color schemes I might like to use when I redesign the site .. putting into practice my new web-stud skills. Sorry I can't link to the schemes I really like, but I posted a few here on this page, and anything (done by someone with design skills) is likely to be far better than what I have now. Lastly, the bug is gone. Left a few days ago. Flew back East, with his mom, to be with her family for the holidays. I signed off. (Always do.) Altho this time he didn't seem eager to go. " I wanna stay with you, dada, " he said. Actually, the first thing he said was, " I want you to come, too. " .. after I tried to put a positive spin on the situation » "You're gonn a have a fun time on the big airplane." So I've been sad. More so than expected. Got the blues. Gave up some of my days with him, so he could go. Friends don't think I should be so accommodating, considering. But he'll have a good time, and that's really what counts. The Bug will be 3 next month. And I'm finally starting to learn a few things about this parenting thing. The *reason* parenting is such a powerful thing .. is cuz it deals with the issue survival. Nature programs us with powerful instincts that ensure the species survives. And our offspring (in terms of the species) is even more important than the parent. This is why we find ourselves "sacrificing" for our kids. We may not make the ultimate sacrifice, but we do so in ways more subtle. Which is why our actions often bypass the decision-making process. We simply do what we must .. as dictated by our species' genetic hard-wiring. 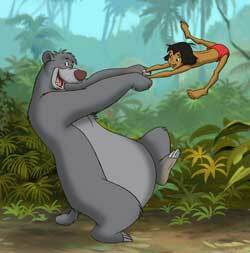 Yes, the act of parenting has an influence on the survival of the species. If you were God, would you leave it to chance? Probably not. We have (as you know) powerful incentive to procreate, and once this is accomplished, other priorities take precedent. Anyway, figuring out *why* I do & feel certain things, as a parent, and why the Bug always comes first .. even when I don't consciously *try* to adopt this perspective .. is a curiosity that's always intrigued me. I see it happening, but never really understood the dynamics. Now, I feel I've gained some insight. It's about survival (but not mine). This is my theory. If you don't hear from me before then, I want to wish everybody a Merry Christmas. 18.December.2007 » Got back in the gym yesterday. First time since I went sailing over the handlebars and landed on my head. It's been 10 weeks. Felt good to throw around some iron. Everybody came up, asking, " Dude, where you been? " Felt stronger than I expected. No major problems. Neck is still stiff, but no longer painful. My left hip however, felt a little weird on some exercises. Same with my right shoulder. Fortunately I was in decent shape before wiping out, having mountain-biked regularly prior. But after a month or so of inactivity, the body begins to lose tone. Endurance wanes. You start to feel yucky. A trainer there, who used to be a physical therapist, said I " need to get increased blood flow " to my neck .. to promote healing. " You can do that, " she added, " by applying heat or massage. Both techniques dilate. " So afterwards, I hit the sauna—first the steam, then the dry (dry is hotter). The neck definitely feels better today. I also been getting regular massages, twice weekly. Ran into my physical therapist at the coffee shop last weekend. " Call me this week ," she said, " and we'll schedule an appointment. It's fine if you need to bring the bug. " I've been reluctant to do that cuz therapy is painful (& exhausting), but maybe now I will, since my massage therapist left for vacation. On a geekier note, here's a neat, little tool you might enjoy » Launchy. Read the short PDF that comes with the installer. The program is accessed by pressing ALT+Spacebar. Pretty cool (and free). 16.December.2007 » Restored my first Ghost 12 image today. (It worked!) You might recall the problems I've been having with the DC input jack on my laptop. Went to dinner last night and caught a movie. When I returned, the laptop was dead. (Battery completely drained). Normally I shut the lid when/if I won't be using it for a while. Could kick myself for letting it run unattended. Was able to restore a/c power by jiggling the cable, but the laptop still wouldn't boot. What a horrible feeling (as you know). None of my tricks worked. Even after the battery was fully charged (and I crossed my fingers and said a prayer) » no dice. Last Known Good config was » no good. Couldn't even boot into safe mode. That's when I knew it was bad. Still don't know what went wrong. I mean, a dead battery shouldn't prevent your laptop from booting (once power is restored). But I could load drivers in safe mode (before it would blue-screen and auto-reboot), so I knew the drive itself was accessible (sign of hope) .. cuz I thought I heard it making funny noises earlier. So I went to sleep. Woke up at 3AM and tried it again. Presed the button » nada. One last time in the morning » nothing. Dang. I started sweating bullets when I couldn't find the Ghost Recovery CD. "Where the heck did I *put* that thing?" I asked myself. If I couldn't find it, that would introduce a serious headache. Tore the place apart .. before realizing it was stashed right under my nose. I booted with the Ghost 12 Recovery CD. No problemo there. First I ran a virus scan, which turned up clean. Regulars may recall how I resisted the idea of depending on a Windows-based imaging solution (for reasons detailed » HERE). But Ghost 12 restored my back-up image just fine. And it worked quite slickly, too, I might add. I found the Restore interface very intuitive (idiot-proof). Whoever designed it deserves kudos. I especially like how each back-up image (now called a Recovery Point) was labeled with it age. My most recent back-up (for example) was 20 days old and listed at the top. I didn't even have to do the math to figure out how old the image was. Now I am catching up on 20-days worth of updates. Folks unfamilair with how a back-up cloning/imaging utility works often cite Windows Restore as their (dependable) ace-in-the-hole. But Windows Restore will do nothing for a dead drive (because Windows stores the files used to restore the drive on the same drive, which all Rad Warriors know is BAD). That's why you need an imaging utility (such as Norton Ghost). No doubt you've heard the adage (by Ben Franklin) » an ounce of prevention is worth a pound of cure . Nowhere is this maxim more true than when it applies to a hard drive imaging/cloning program. Word to the wise. 11.December.2007 » Still reading CSS Mastery. Very rich. It's much smaller (thinner) than the Head First book on XHTML+CSS I read earlier this year (only 250 pages vs 650), yet reads more slowly, because it contains much food-for-thought (regarding styling techniques). On nearly every page, I find myself pausing to reflect .. often muttering, "I didn't know you could do that." It's a book that lends itself to study more than mere reading. It's obvious the author (Andy Budd, from Brighton, England) is in a league of his own, having "become one with" the language (CSS). This book begins where the Head First book left off. The first (introductory) chapter presents many of the same concepts and techniques introduced near the end of the Head First book. The reason I originally considered skipping this book—despite its many glowing reviews—is cuz CSS Mastery is known for its expertise in dealing with (proprietary) browser quirks/bugs found in IE6. IE7—which fixes many of these bugs/quirks—was released a year ago, so I figured everybody (like me) had since upgraded to IE7, rendering this book (more-or-less) obsolete. So it looks like I need to familiarize myself with the idiosyncrasies of IE6, and therefore CSS Mastery remains relevant. Reading this book is frustrating, cuz every time I learn a new technique, I want to stop and go re-write the site, putting my new skill(s) into practice. If you've been Radified for any length of time, you know how I like to jump in and "get messy" with new technology, which is (btw) how I learned most of what you'll find here. But I'm resisting the impulse, choosing instead to stick with the learning phase. One of the best ways to learn Cascading Style Sheets (CSS) is to jump right in and start tinkering. However, if you’re not careful, you may end up misunderstanding an important concept or building in problems for later on. In this chapter, I am going to review some basic, but often misunderstood, concepts and show you how to keep your (X)HTML and CSS clear and well structured. I *have* however, made some minor tweaks to the homepage styling, such as increasing line-height (to 1.4 ems) and decreasing the brightness of the font you're reading (from #CCC to #A1A1A1) .. to make it a little easier on your eyes. Among other tweaks, which you might've noticed. Difficult to keep my hands off it. I don't want to see him. I mean, if your dad can't see you (cuz he's fighting in Iraq, say for example), that's bad enough. But if he doesn't want to .. uh, that's much worse .. something which could affect a child .. their entire life. So it's important the Bug knows » I want to see him. Whenever I pick him up, the *first* thing I do (soon as we drive away) is make a BIG DEAL about how happy I am to have him. I mean, I really whoop it up, big time » " Wooo-whooo! It's dada's turn to get the Bug. " (High-five's ensue.) Then (after a while) I say, " I wish I could have you more. " " But we have to share ," he responds. (It's too cute for words.) Then we do this role-reversal thing, where I protest (like *he* sometimes does) .. " But I don't WANT TO share. " " But we have to share, dad, " he repeats. " Mom wants me, too. " To which I continue my childish protest, " No. no. no. I don't WANT TO share. " " But we have to share, " he says, calmly, like an adult .. until I finally relent and say, " Okay, if you say so. " May seem silly, but it helps convey my point » that I *do* want to see him more. And it's all true, of course » I really do want to see him more. And this is something I've been trying to convey since .. well, he wasn't yet 6 months old when his mom and I split up. So this is something that's been bothering me FOR YEARS. Gnawing at me. And this week was the first time I felt certain he got it. Huge relief. Until recently, this was a topic too uncomfortable to discuss. Cuz there was really nothing I could do about it, and so much time I can't be with him. Along these lines .. I was talking to a girl recently, who said, " I *think* my dad loved me .. in his own way. " I didn't say anything, but thought, "That's sad. Cuz if your dad really loved you, you wouldn't *think* it .. you'd *know* it." 05.December.2007 » Back in August, when I was researching the best book to learn CSS, I was suspicious of all the glowing comments at Amazon.com for CSS Mastery. CSS Mastery Really That Good? I mean, they sounded too good to be true. I'm especially suspicious of reviewers who post one (and only one) comment, along with those exhorting the reader to either " Buy this book! " or " Don't buy this book! " Reviews should present the review's opinion, not try to influence purchasing decisions, cuz everyone's criteria is different (.. which is how I came to trust Nate's reviews). Anyway, curiosity got the best of me, and I started reading CSS Mastery this week. And while some of those comments may indeed be phoney-baloney (who knows for sure? ), I can now see what everybody is talking about. Molly is the book's technical reviewer, and I read she can make *any* book shine. So maybe she is the reason for the sparkle that occurs in your brain while reading. Although the goal is to keep your code as lean and meaningful as possible, sometimes you cannot avoid adding a non-semantic div or span to display the page the way you want. If this is the case, don’t fret. We live in a transitional period and hopefully CSS3 will give us greater control of our documents. In the meantime, realworld needs must often come before theory. The trick is knowing when to make a compromise and if you are doing it for the right reason. Speaking of "meaningful code," I've been researching the terms "Web 2.0," and "Semantic web," and "Ontology," because this is where people-in-the-know (such as Tim Berners-Lee, the guy who invented the web) say the web is going. But this is a topic for another day. Large topic, about which many books have been written (such as this one, which I've skimmed), and I do not yet have a good grasp on the topic. But CSS Mastery emphsizes the concept of semantic mark-up .. so we're already headed in that direction. The way my brain works .. is I first like to get a handle on the basic concepts & key terms, so my brain can create categories ("buckets," if you will). Later I can return to the material, and find it much easier to digest the concepts in greater detail, cuz my brain has had time to create a conceptual framework into which I can deposit the new information more rapidly. But we all learn differently. I can power-thru just about *any* material .. but I don't enjoy learning that way (like drinking water thru a fire hose). BTW - speaking of the guy who invented the web, here is a "very short" personal history of the web I found, authored by TB-L. Very interesting, especially the part about the brain's ability to "store random associations between disparate things," which was his motivation for inventing the hyperlink, the very heart of what makes the web the web. In other words, the web was patterned after the way the brain works. PS - Today is bro's b-day. Happy b-day, bro. Bro is a surgeon (orthopaedics) .. in Tennessee. If you need an operation, I can get you a good deal. =) He's gonna celebrate by watching Pirates of the Caribbean III. 04.December.2007 » One of the best things about having a web site such as RADIFIED .. is the mail I receive from interesting folks who live in various parts of the globe .. such as Stephen from South Africa (where it's almost summer), who drops a line every month or two, to say 'Hey' and share his latest adventure (technical or otherwise). » I like your tone on the site. And while I value the content, I like *that* you take the time to do this good-thing which humanizes and graces the human family. I appreciate that you do this for all of us, so I sent a token of my thanks. One of my favorite things is to take a golfing trip to the US in winter. I usually drive down with a buddy and hack up your turf. Again, thanks for the fine thing you've committed to, and may the Force be with you. "Humanizes and graces" .. I like that. Always nice to get a compliment .. cuz many of the comments I hear here are not so encouraging. Rad, I'm taking the plunge to MT4. All the features I wanted in MT3 are in MT4. I messed up some stuff while installing the anti-spam plug-in, so I’m gonna install a fresh copy of MT4 and move everything over from MT3. What are your plans for making the transition? Got a new job! No more medical software for me. I'm off to the wonderful world of Jeeps & Interwebs! My official title is Internet Content Specialist at 4WD.com, where I'll take care of online inventory. Been here barely 2 weeks, but so far it's a blast. Being an off-road enthusiast, I already know most of the folks who work here. I'm not into coding the site yet, but have a feeling I will be, eventually. Peeking at the current HTML makes me queasy, tho the M$-SQL backend (database) is very nice. Good table structure. I'm frequently there, updating part numbers, product ID’s, image locations. Lastly, as part of my duties, I update the front page of JeepsUnlimited. The entire page was created with Mambo - similar to the Joomla & Drupal CMS's you mentioned a while back. The site runs itself .. except for the forums. (Ugh, don’t ask). That’s it. I'll keep you posted on the MT4 upgrade. Congrats on the new job. (Any free Jeep give-aways?) I am going to wait for the Open Source version of MT4 (called MTOS), which is scheduled to be released "by the end of 2007." I'll install a fresh copy, leaving alone my MT3 install, in case I need to go back to it (for any reason) .. just like I left MT2 installed, when upgrading to MT3. On a different note, I got a massage last night. My neck felt the best yet (loose), since the accident. And the massage didn't hurt, like the physical therapy did. Anybody catch the Patriots game last night? They're still undefeated. (Barely.) Best game I've seen in a long time. Hi-Def TV is so much better. Amazing clarity. First a killer massage, then a great game (on HDTV), while chowing on a gourmet dinner. Feel like a new man. 02.December.2007 » Adios November, hola December. Today is the anniversary of my getting out of the Navy. The military calls it » EAOS [End of Active Obligated Service]. The six years that (seemed like they) would never end. Unfortunately, I didn't learn that counting days-remaining only slows time .. until I was already out. I remember walking out of the Admin building (in Bangor, Washington) after signing my discharge papers [Form DD-214]. Tho I still had a few days remaining, the sky (literally) looked bluer (not a figure of speech) ..
.. the grass greener. Birds were chirping. My feet seemed to hover just above ground. Boundless energy at my command. A sense of satisfaction oozed from every pore. Funny how it was obviously late November, yet my recollection of that day seems more like mid-summer. » In more-technical news, I created my first image using layers (in Photoshop) today. If you scroll down to the previous entry, you'll see I put some radEyes in the skull pictured on the pirate flag there. Simple, but the technique is the same, no matter how sophisticated you wanna get. Back when I first heard about Photoshop, a friend mentioned the program's real editing power was accessed by learning how to use layers. Of course, it's much easier to learn when you have somebody showing you how.